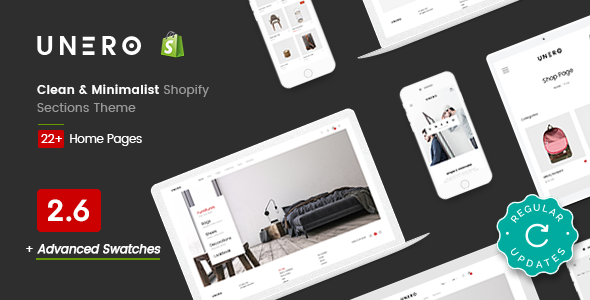 Unero is a clean & minimal Shopify Sections Theme for shopping online stores. With design minimal and focus on products, Unero will make your online store look more impressive and attractive to viewers. Help increase high conversation rate to buy product with your customers so quickly. This theme is suited for a lot of e-commerce website such as fashion store, furniture store, decoration store, etc. Furthermore, this amazing theme is included with lots of features, mini cart, free wishlist app, unlimited color schemes, beautiful slider, product comparison, mega menu with multiple column styles and more… You are free to control this theme in order to make your store more friendly and adorable for your customers.